It is important to collect an adequate specimen for rapid Influenza testing. Test sensitivity is optimal with minimally diluted specimens. Therefore, the preferred specimen for rapid flu testing is a mini-tip nylon flocked swab in 1mL Universal Transport Media (UTM item 406C from Materials Management) or a saline nasopharyngeal aspirate/wash with the minimal amount of saline required. The mini-tip flocked swab in 3mL of UTM (RML Supply# 50775 from Materials Management) is still acceptable. 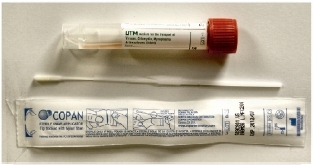 Swabs submitted in sterile saline are stable for 24 hours, if refrigerated (4 hours room temperature). For Saline nasal wash: Use bulbous syringe to dispense 2 ml saline into nasal passages. Aspirate at least 1mL back into syringe and transfer to sterile container. Nasal washes are stable for 24 hours if refrigerated (room temperature stability is only 4 hours). Note: The eSwab is no longer acceptable for influenza testing. UTM (recommended), M4, M4RT, M5, M6, saline, and Starplex Multitrans are acceptable. However, add on testing may not be available for all of these transport types.